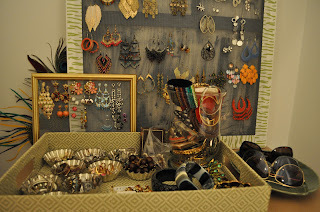 When I was home for Christmas I visited Furbish (the cutest little home goods boutique ever) and bought some jewelry. I know that sounds weird to say I bought jewelry at a home goods place, but they have WAY cute stuff. I specifically went in for a pair of earrings for Kelsey's Christmas gift, but of course I found two pairs for myself too. They wrapped them in pink tissue paper. And then I never saw it again. My apartment is completely unpacked and I have looked at every single belonging of mine throughout that process. The only thing I can deduce is that in unpacking, I started to use the Target bag as a trash bag, and I threw away the pink tissue paper package away along with all the other rubbish. I have never mourned the loss of earring so much. They were really fabulous. They looked like this. And this. 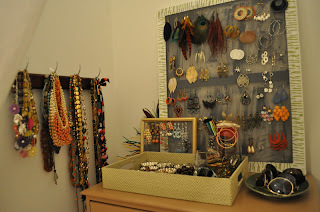 I came up with some ideas for new ways to organize my jewelry because my old situation wasn't working for me at all. I was really hoping to run across that pink tissue paper package when I worked on my earring organization, but no such luck. Speaking of my earring/jewelry organization, here are some close up shots. This nook was the perfect size for my dresser. 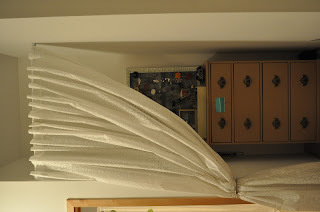 Since I didn't have anywhere else for my jewelry I thought that this nook, with the curtain kind of hiding it from plain view, would be perfect. Necklaces are hung to the left and yes, they are kind of sorted by length. 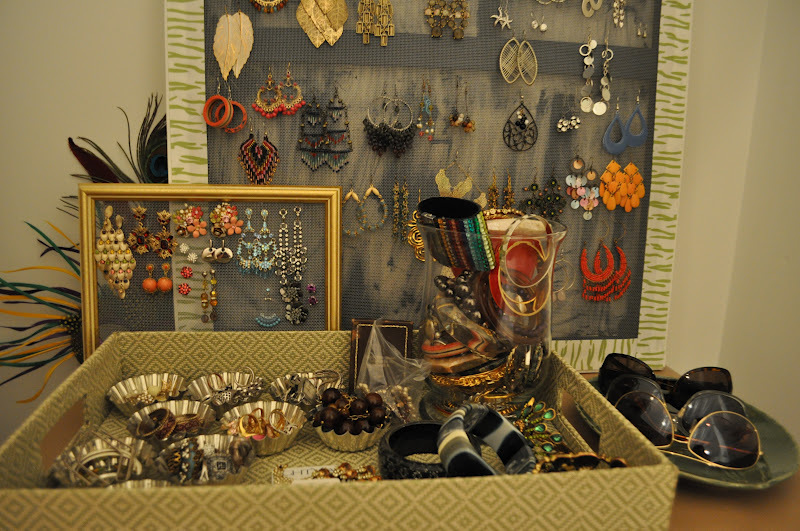 Here's a close up of the earring stuff. I used a 24x30 inch canvas and then staple gunned screen to the back. I did streak some navy paint on the back side of the canvas before doing that. Also, I would recommend buying screen from somewhere that cuts it to size because otherwise the smallest amount you can buy prepackaged will leave you with WAY too much. 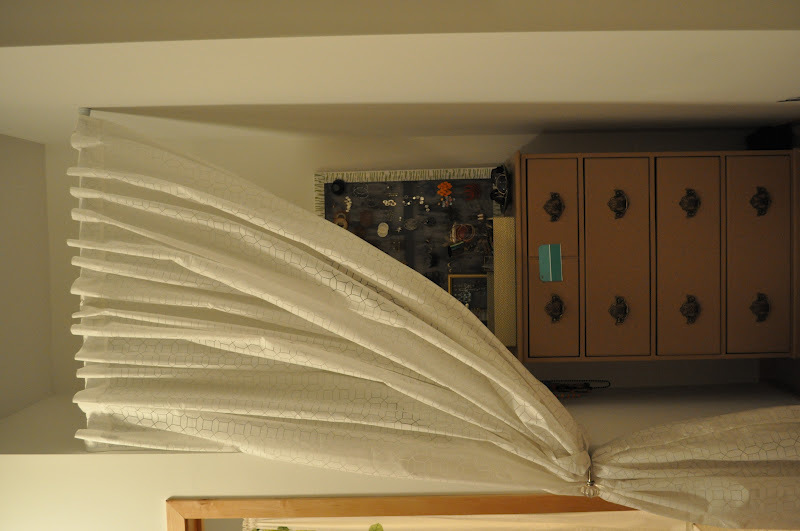 I covered the stapled edge of the screen by glue gunning some ribbon around the edge. I use the canvas for earrings that have hook closures. The smaller screen is for those with posts that need to be secured to stay in. Hoops are down in the silver tins in the tray. So far it's working out perfectly. It's one of my favorite projects I did in this new apartment and it seriously makes getting dressed so much easier. It also makes it insanely easy to keep everything organized and I'm loving the fact that everything has a place, and everything is in it's place.